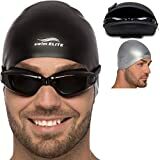 ☞Please clean swim cap in cold water after each use. ☞Please wash the cap with your hand instead washing machine. ☞After cleaning, wipe completely dry in the shade instead of exposed under sun. ☞If you have long hair, please roll your hair into a bun upward and tie it with a little rubber band before you put on the swimming cap. 12 Months Worry-free Product Guarantee ensures long-lasting enjoyment of your purchase. If for any reason you’re not completely satisfied with the quality, simply let us know and we will either replace it or refund your money. ✔ PREMIUM SILICONE MATERIAL: Made from 100% the latest advanced silicone material which is odorless, non-toxic, skin-friendly and allergy-free, and it has better advantage of stretchy and elasticity, no deformation after repeated usage. 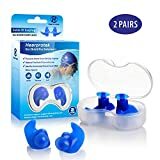 ✔ 3D ERGONOMIC DESIGN EAR POCKETS: Apply of 3D stereo design makes the swim cap a comfortable fit for most people, prevents over-pressure and keeps water away from your ears. Thick curved edges wrap your forehead, ear and head tightly to prevent the water getting in, less resistance under water. 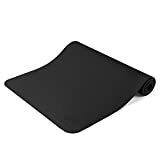 ✔ HIGHLIGHT FEATURES: Waterproof design keeps hair & ears dry protecting your hair and ear from bacteria, chloride and other substances in the water. 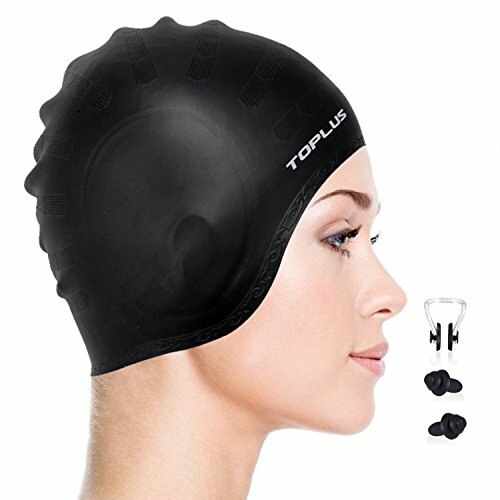 This swim cap has a durable and elastic surface that provides a smooth feeling, which makes this swim cap extremely suitable for long hair and short hair, both women and men can use it. Anti-slip design and easy to take on and off. 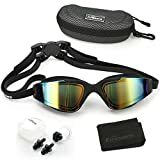 ✔ ADDITIONAL ACCESSORIES：Nose Clip and Ear Plugs are included in the kit so that You won’t have to think about over-pressure or water getting into your ears or nose you’ll be able to swim with maximum comfort. ✔ RISK-FREE WARRANTY: Every order from us enjoys Unconditional 1 year Warranty. If you have any problems, our friendly and easy-to-reach customer service are here to solve your problems within 24hrs.